Is Microsoft’s all-in-one desktop the touchscreen iMac you’ve been waiting for? The specs aren’t earth-shattering, but in use the Surface Studio is wonderful. The screen is beautiful and being able to tilt it to pretty much any angle in an instant will have creatives hankering for it. When you first lay eyes on the Surface Studio in the flesh, it’s undeniably a thing of beauty. A huge 28-inch, high-resolution, high pixel density display is at the heart of the machine, which seems to float above the base that houses all of the hardware. We know your first question: is this a suitable alternative to an iMac? The answer, on first impressions: 100 per cent yes. Apple has done a great job in blending aesthetics with power – but with the Surface Studio Microsoft has produced something as desirable, if not more so, thanks to its unique Studio Mode feature. What is that? Well, with a light touch – and it is literally a one-handed light touch – you can lower the Surface Studio down to an angle upon which you can sketch. The hinge is actually quite remarkable, enabling you to position the display at pretty much any angle you like (down to a drafting position – it can’t go completely flat). Another thing you don’t get with an iMac is a touch-sensitive display (10-point multi-touch). 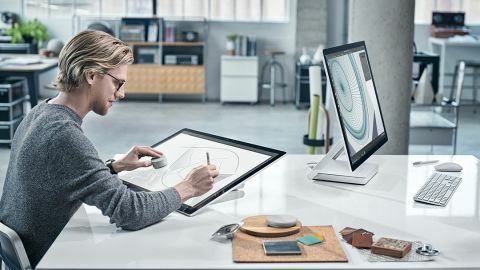 Not just touch-sensitive, mind, as you can use the new Surface Pen to accurately sketch, draw and design – it’s got 4,096 levels of pressure-sensitivity and can recognise tilt and so on. Using the Surface Pen on such a large screen is, frankly, a fantastic experience. There’s pretty much no lag at all and we felt it to be a hugely responsive drawing experience. There’s another trick – the Surface Dial. This is a puck that you place on the screen or next to your keyboard giving you extra controls. For instance, turn it as you’re drawing to change the tone or width of your line. Using the Dial on-screen is a very interesting experience and one that is very intuitive – although we’re still not quite sure how it actually stays on the screen. With a click and a turn you can select different options for controlling your brushes and so on. There’s only a few apps that currently give you specific options when using the Surface Dial (Creative Cloud apps don’t have any special functionality, so you’re limited to zooming there). We had a play using Sketchable and switching between line width and colour was fluid, and, actually a lot of fun. As soon as Adobe updates its apps to work with the Surface Dial, we’ll be even more interested – but until then the Dial is a little bit of a gimmick. Let’s go back to the screen. In real life this thing is incredible. Absolutely stunning. With a PPI of 192 and a 4500 x 3000 resolution this is pretty much as good as it gets. It's bright and blacks are incredibly black – we have absolutely no complaints. And build quality is equally impressive, with the screen at only 0.5-inches thick. Our time with the Surface Studio was limited, so we couldn’t put the machine through rigorous testing – and we couldn’t install Creative Cloud. So we’re going to have to save that part for the full review, coming soon. On paper though, the Surface Studio is no slouch. The base model has a 64GB SSD with 1TB HDD (hybrid drive), 8GB RAM, a Core i5 CPU and GeForce graphics with 2GB RAM. And even this, the lowest-end model, will cost you around a whopping £3,000. Yes, three grand. Spec it up to a 2TB hard drive, a Core i7, 32GB RAM and 4GB GPU and you’re looking in the region of £4,250. An outrageous amount of money. Port-wise you get 4 x USB 3.0, an SD card reader, a Mini DisplayPort, Ethernet and 3.5mm headphone jack. But all of the ports are on the rear. We wouldn’t mind the aesthetic being slightly marred by having a USB port on the front of the base. Oh, and there’s no Thunderbolt either, in case you were wondering. We’d like to see better graphics in the Surface Studio – due to older graphics cards it doesn’t officially support VR on the base model, and only just tops Oculus’ requirements on the high-end machine. We’re not sure this will be a deal-breaker for creative pros, but it’s something to bear in mind (and we didn’t test any VR apps in our review). Oh, and of course it runs Windows. Windows 10 to be precise. These days cross-platform file compatibility is less of an issue, but bear in mind that you will have to adapt to a new OS if you’re switching from an iMac. It’ll be interesting to see how Apple’s forthcoming iMac Pro compares for price versus specs (and specs look hugely impressive ). The point is the Surface Studio is a huge investment, and that's even before you add the cost of the Surface Dial. One thing we’d also say is the keyboard and mouse felt pretty cheap for such an expensive machine – they didn’t match the aesthetic of the display, hinge and base at all. But, the fact is, when you’re sitting in front of the Surface Studio, the expansive screen engulfs you. It’s an immersive environment in which to work. And very natural as you can, with just a small hand movement, adjust the screen from sketching to accurate plotting or editing. Although our hands-on time with the Surface Studio was limited, we came away thinking of all the unique possibilities. The Dial has a lot of potential but needs to be supported – and implemented in the right way – by the likes of Adobe for it to be truly useful. The Surface Studio feels like an evolution of what the all-in-one is for the creative professional. It looks incredible, has ample power (at a price) and can be adjusted to your liking, making it a more personal creative environment.